We are celebrating Independence Day this week. It's difficult to explain to a three year old that we are celebrating our country's birthday... especially when he doesn't exactly understand what I mean by "country". He does, however, sort of understand our home, our street, our city, and maybe a little about our state. 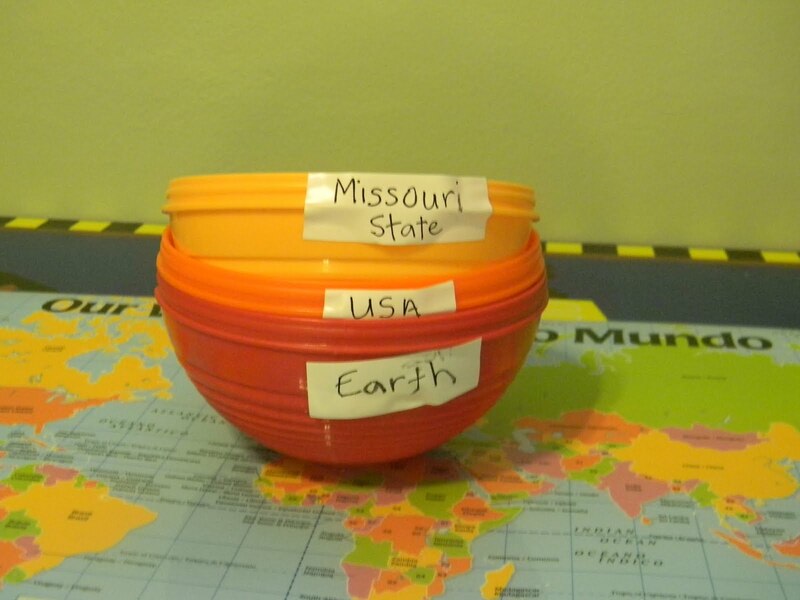 Last weekend, we traveled across state lines from Missouri to Illinois so we had an opportunity to talk about that. 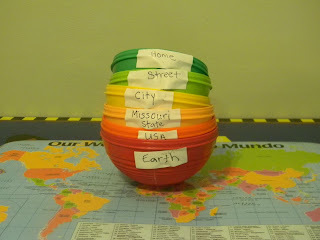 However, I decided to try and help him visualize where we fit in this big wide world with a simple nesting cup activity. (I used to do this with older kids when I was teaching, so this is a lesson we will probably repeat many times). 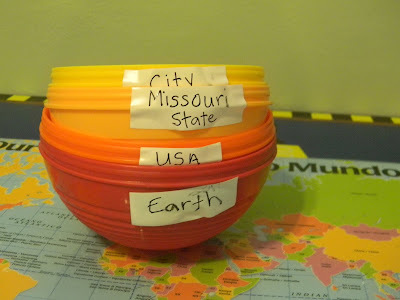 We began with the largest nesting cup which I termed "Our world". 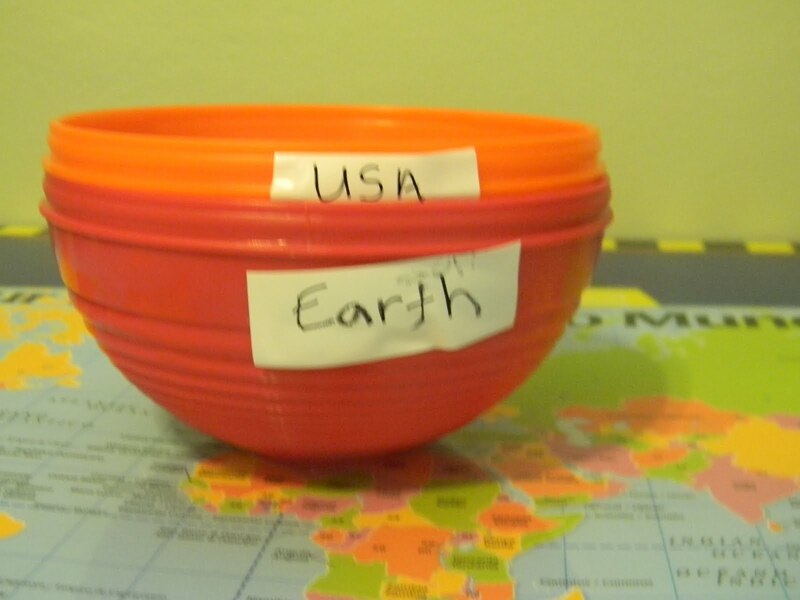 The next cup represented "Our country". I put it inside our world. 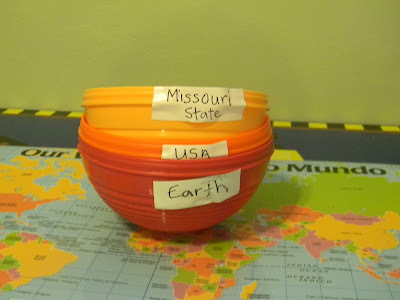 Inside of that cup, I placed "Our State, Missouri". Inside of our state, I put our town. Inside of our town, I put our street. Inside of our street, I put our house. Of course, you could break this down in different ways to fit your region. You could also include continents, counties, etc. This was all that I could get a three year old to attend to. After doing our nesting cups, we made a playdough map of the world. I found this idea at Hubbards Cupboard. Basically we just put a big blob of playdough on our country and then stuck USA flags into the playdough. My boys are really into playdough, so this was a huge hit. This week's theme at the Smart Summer Challenge is Me on the Map. I thought this activity would fit wonderfully! Oh, and check out some of our favorite books to celebrate America's Birthday! very clever! I may have to try that with my 3 year old. It's a tough concept for a little guy to grasp. Love, love, love! Our plan is to do this with stacking blocks tomorrow! I saw this post and was just going to ask you to add it to the Smart Summer linky (up right now at my site!) and then I saw you have the button there all shiny and ready to go! Hope you'll come add the link to our widget! Such a simple and accessible idea, but oh so effective! 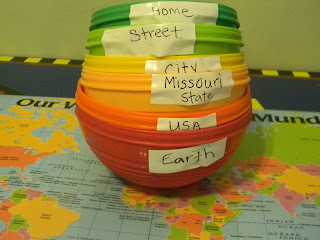 Great idea and wonderful new way to use nesting cups/bowls!! 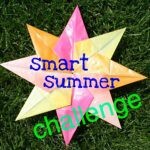 Thanks for linking up and sharing with our Smart Summer Challenge! 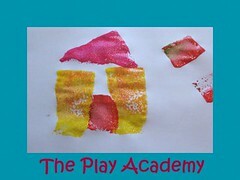 what a great way to teach this concept to little ones! Many of my elementary students are also confused by this- I'd love to try something like this with them. Wonderful idea to offer "where we live" a bit more concretely! Thanks for the post! This is a pretty neat idea! My daughter is almost 5 and she is still vague about country concept despite a lot of geography "enlightenment" in our house. 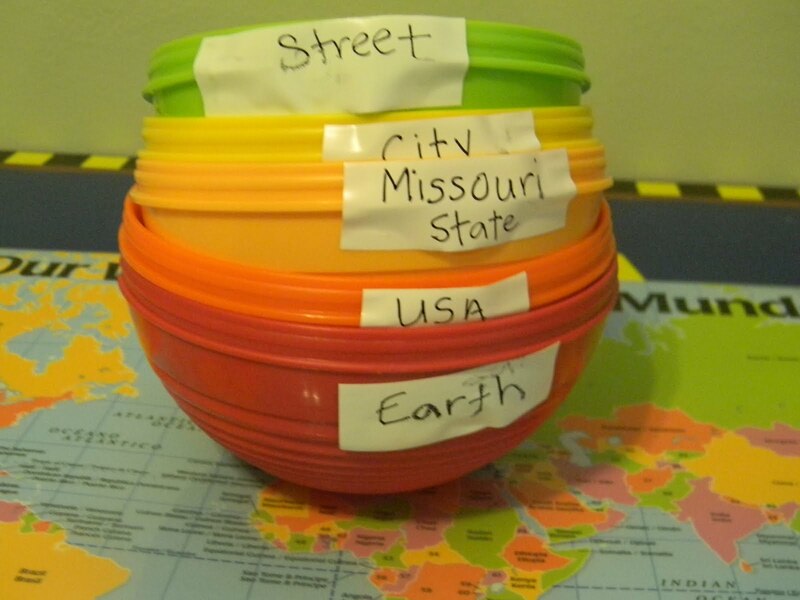 We do add continents to this hierarchy and use our matryoshka doll to make it visual. I absoluately LOVE this idea! Found it on Pinterest! Thank you for sharing - I'm getting ready to work on continents with my son and what a great way to visualize the lesson! 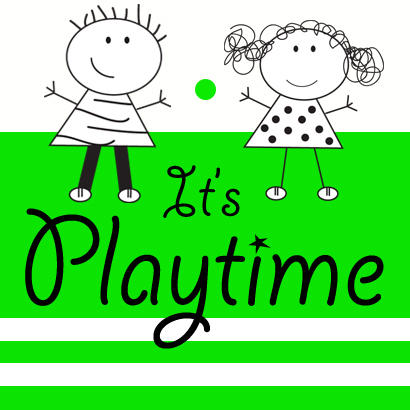 We just made something similar: http://lifewithmoorebabies.blogspot.com/2012/09/our-place-in-world.html. While looking at yours I noticed you are also in Missouri! Awesome!